If you’re striving for some serious business growth in 2018, the Success Summit is the event for you. A huge hit in 2017, the Success Summit assisted many of our Associates in taking their businesses to new levels. The Success Summit is back for 2018 and we couldn’t be more excited! If you’re ready to take things up a notch, check out how the Success Summit can help you achieve your goals and see what some of our qualifiers have had to say about the event. 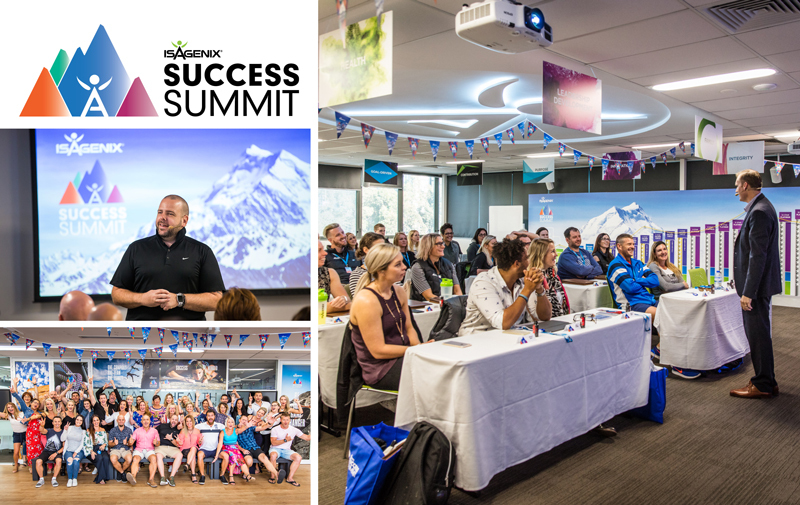 The Success Summit is an exclusive event that provides an opportunity for new Isagenix Executives and Crystal Executives to learn the principles to help set your business up to reach 3 Star Golden Circle or higher. Learn from Corporate staff and seasoned professionals who have proven success building their Isagenix business, at a private and unique training event in Sydney, Australia. Interested? To get the lowdown on the qualification periods and how you can qualify, check out the Success Summit flyer here and learn how you can earn your spot to attend this exclusive training opportunity. * One prize per qualifying account will be awarded, which includes return economy airfare, twin-share accommodation as selected by Isagenix, hotel transfers and activities. The qualifying Associate is responsible for incidentals and any other fees and costs. Open to Australian and New Zealand Active Associates only. Participation constitutes your full and unconditional agreement to these terms and conditions and any promotion rules, FAQs or guidelines posted and the decisions of Isagenix, which are final and binding in all matters related to the contest. All dates and times shown are US EST. Prize is not transferrable, non-refundable and cannot be redeemed for cash value. Flights must be redeemed with the Isagenix travel agent. Contest rules are subject to change, including adjusting qualifying criteria for future Qualification Periods. Isagenix reserves the right to audit, adjust or deny any volume, compensations, recognition or other incentives awarded during or as a result of this contest to ensure the spirit of the contest is achieved. Associate enrolments and product orders that are deemed, at the sole discretion of Isagenix, to be solely for contest advancement may not be counted in the contest. All members are subject to standard compliance reviews both during and after the close of the contest; prizes may be withdrawn by Isagenix at any time. Outstanding compliance matters will affect eligibility for the final prize. Any person who attempts to manipulate the Compensation Plan or the contest, or who otherwise attempts to circumvent the rules, forfeits any and all rights to receive any prize and will be disqualified from the contest. Rewards may be recouped in the event of refunds of product sales used to qualify for the contest.